Angry Bear » Quelle Surprise, Labor Productivity is Up while Labor Wages are Still Down! Quelle Surprise, Labor Productivity is Up while Labor Wages are Still Down! BLS economist Shawn Sprague writes What Can Labor Productivity Tell Us About the U.S. Economy? Labor worked the exact same number of hours in 1998 as they did in 2013 or ~194 billion hours. While there was no growth in the number of hours worked, the Non-Institutional Civilian Population grew by 40 million people, and new businesses were created by the thousands which should have needed more Labor. 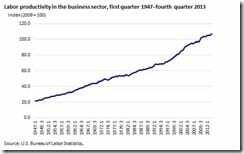 Mean while American businesses produced $3.5 trillion in goods or 42 percent more in 2013 than in 1998 even after adjusting for inflation. To repeat, during this period “the Business sector output grew by 42 percent, Labor hours did not grow at all, and Labor productivity (the difference in these growth rates) grew by 42 percent.” Sprague explains further; “if labor hours had grown instead by 10 percent during the period, then labor productivity would have grown by 10 percent less, or 32 percent. If labor hours had instead grown by a full 42 percent, then labor productivity would not have grown at all during the period. These examples illustrate that it is the interplay of output growth and labor hours growth that is fundamentally important to understanding labor productivity.” Labor hours of input did not grown, so what happened? Increases in throughput (as I would call it) can be achieved through more efficient equipment; faster, experienced or trained Labor; less down time for maintenance, utilization improvements, and less scrap or better materials. “In these and other cases, output may be increased without increasing the number of labor hours used.” I am gong to assume this could mean the addition of more Labor without adding hours. Here we have a situation of increased business gained through efficiency and the resulting Productivity Gains not going to Labor and remaining with Capital. Shawn Sprague does not really delve into this topic; but, it is apparent within some of the earlier posts by Spencer England Labor’s Share, others as well, and Shawn’s footnote 4. Isn’t this a part of what Piketty is pointing out in his narrative on the growth of inequality? There is no reason for business to hire more Labor to meet the increased business or shorten the work week to accommodate more workers as it would tighten the Labor Market and increase Overhead and Labor Wages. Best of both worlds for business, increased profits and a loose Labor market. Your commentary presumes a manufacturing focus – incorrect largely due to manufacturing’s low percentage of the labor force. 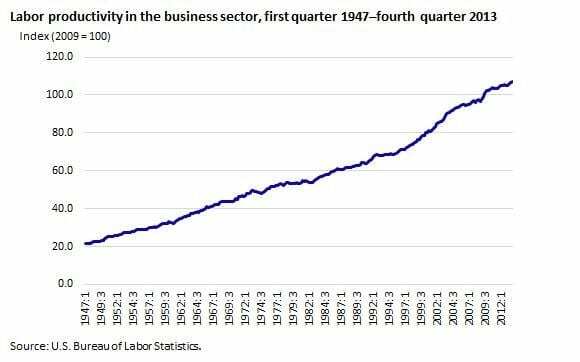 As services predominance means that productivity is coming more from people than from capital (vs manufacturing), any excuse for not paying workers for productivity is just not supportable in this view. Whether it be Service or Manufacturing, the productivity gains from either venture are not going to Labor and are remaining as a part of the return to Capital. My old Teamsters local 804 (left in 1970, age 26) recently won (as they like to phrase it) a 30-and-out retirement benefit of $3900 a month. Which may double what (non-bargaining, not to say not CENTRALLY bargaining) regional pilots earn while still active. Time is a-waisting. A few years ago, Northwest Airlines squeezed a billion dollars in givebacks out of its major airline flight crews only to next year award a billion dollars in bonuses to a thousand of its execs. The pace on the road to serfdom may be speeding up. Help! Now! Why would anyone invest in new more efficient PP&E when 100% of the gains go to labor income? I am gonna give you the benefit of the doubt. Go back and read the post very carefully.